Welcome to the home of the Utterly Brilliant Timmy Mallett! 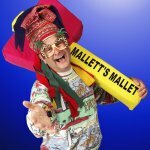 Work is being carried out on our servers at the moment which power The Utterly Brilliant Timmy Mallett website. Sorry if this causes any issues during your visit. Browse the Timmy shop for Pinky Punky and other great items, whether for you or as a gift for someone else! 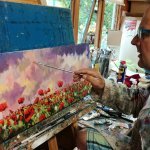 Timmy is an accomplished artist, visit the Mallett’s Pallette website. Book Timmy for your show, celebration, opening event, function or a personal appearance. Get your very own Pinky Punky here! Pinky Punky’s Utterly Brilliant, cute and cuddly and he’s just like he is on the telly. Get your’s now, visit the Timmy Shop! Takes place on May 10th, at The Cookham Festival. Click here for details of other events. We’re currently developing a brand new website, please watch this utterly brilliant space! Book Timmy for your event! To book Timmy to make an utterly brilliant personal appearance at your event, just call The John Miles Organisation on 01275 854675.